Volusia Tree Service provides professional tree service to Ormond Beach and the surrounding areas. We perform both commercial and residential work, and always have the most competitive prices in the market. We will come to your location and give you a free estimate on your tree service needs, and also some free advice on how to make your landscape look great not matter the time of year. If you own a home or business, then you take a lot of pride in the fact that you worked hard to get what you have and you want to keep it looking nice. Part of that is having your landscape complement any home or building that you have on that property. Many people will pay a lot of money for that landscape by getting the grass mowed and fertilized regularly, and fancy shrubs and flowers placed in nice, well-kept beds, but no matter what you do it won’t look its best unless the trees in your landscape look good as well. That is where Volusia Tree Service can help you to achieve your best looking landscape in the Ormond Beach area. We are experts at keeping the trees in your landscape healthy and looking great. There is a lot more attention that trees need than most people realize, and this has to be done on a regular basis, just like cutting and fertilizing your lawn. Volusia County is an ideal environment for growing trees and landscape, but your landscape must be managed in a healthy and proportional way to keep it looking good all year round, and your trees are a big part of that scenario. The following outlines these services in more detail. There are times where one of the trees in your landscape just does not look right, or maybe one or more have gotten old and rotted, and are in danger of falling down. When this happens you are probably better off just removing the tree altogether. Fortunately, we are experts at performing this Ormond Beach tree service work, and always at an affordable price. Is tree removal expensive? The answer to that is that it’s a lot less expensive than you may think, and surely cheaper than an old tree falling on your house. Individual job pricing is always determined by the size of the tree and the overall scope of the project, but rest assured that our tree professionals will offer you the most competitive prices in the area for Ormond Beach tree removal. Violent storms can come up fast, and hurricanes are no stranger to the Volusia county area. When these things happen, it can wreak havoc on the trees in your yard. Branches left leaning on power lines pose a danger to all those around them, and trees leaning precariously or blocking access to driveways and garages can be a problem too. When these types of occurrences happen in Ormond Beach, our professional arborists will be standing by and ready to serve you. 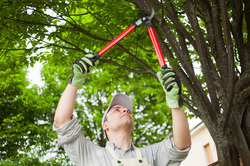 We have all the equipment necessary to safely remove trees and large limbs from where they don’t belong, and to quickly restore your yard to its proper condition. After that big storm strikes, it does not matter whether it’s just a small tree at your home, or many trees at your place of business, we will expertly remedy the situation safely and effectively. There are lots of trees in Ormond Beach, and that also means there are lots of tree companies and that makes for a very competitive situation. At Volusia Tree Service, we are not only tree experts in our field, but also offer some of the most affordable and competitive pricing that can be found in the area. Expert Ormond Beach tree service at an affordable price are a combination that we have developed over many years. Call us today in Ormond Beach at 386-597-1285 for a free estimate for any of your tree service needs at your home or business.